As soon as I saw the neon lights blaring from every corner of Times Square, I knew I was right where I needed to be. 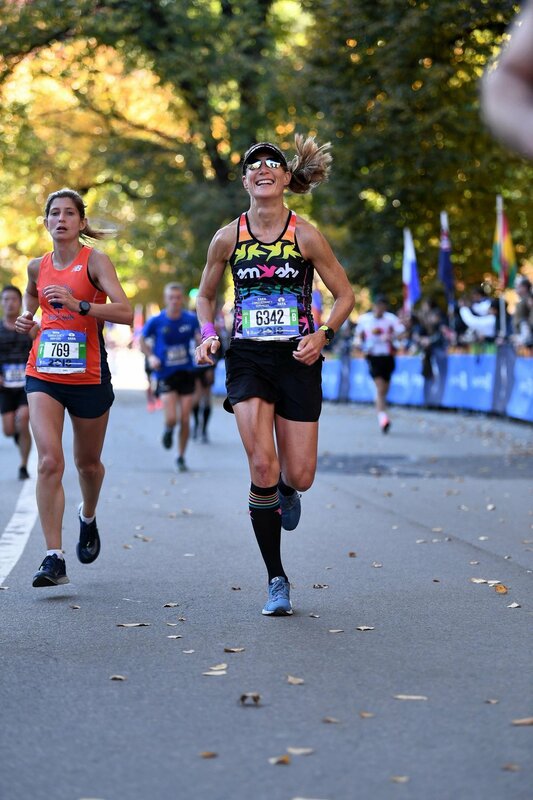 Choosing to run the New York City marathon was the best decision I made all year. The fact that is fell three weeks after Kona did not make it ideal to actually race, i.e. pursue a personal best time, but I was thrilled to be in the city, and less than two days away from running another marathon. I felt welcomed by the thousands or rather millions of locals and foreigners swarming around me, and confident they would be cheering me on Sunday morning. Minutes after I checked in to my Hotel on Friday night, exploring Times Square. First, I just wanted to stand among them in the rain. 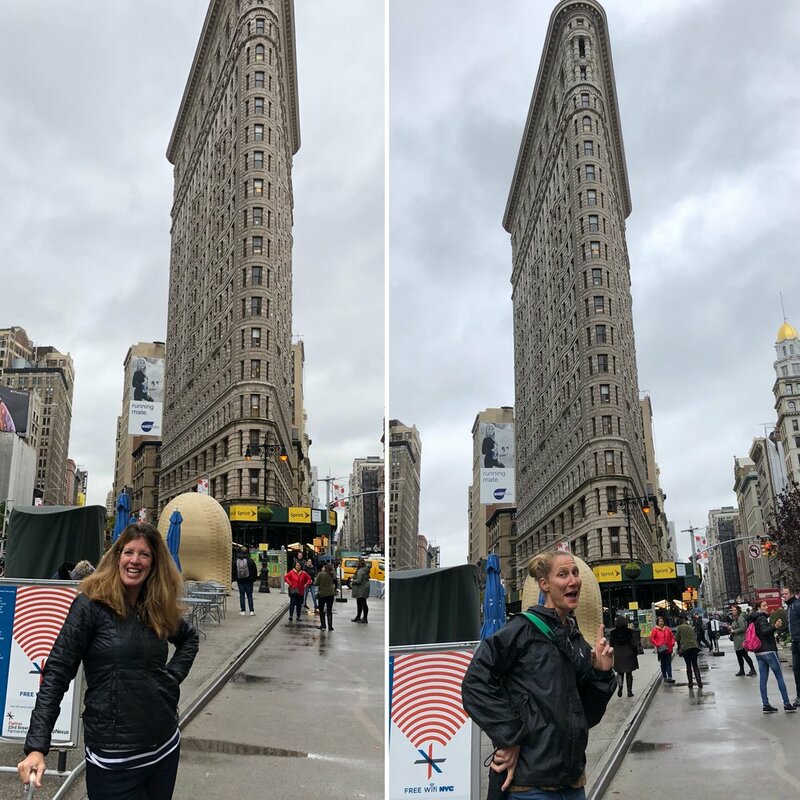 I couldn’t believe it, in a city where I knew no one except my three of my best friends, neither of which lived anywhere near the park, they live in Brooklyn and the lower east side, I saw a familiar face, my TeamSFQ and TeamHPB teammate, Sherri Zehner. My friend and teammate Sherri Zehner and I in Central Park. She was also running the marathon. Sherri lives in Pennsylvania, so we had never met face to face, but we have been friends for a couple of years, so it was wonderful to finally meet in person. She had just run the Chicago marathon four weeks prior, so I was not the only one taking a big bite out of life this weekend. I had no idea where I was going in the park, so I just fell back in with the masses, but felt guilty when I realized I was in the middle of a 5K, and we were approaching the finish line, I loathe race bandits, so I quickly turned up stream and peeled off toward one of the other paths. I stayed on target for my workout, sort of, I neither felt amazing or horrible, just giddy that I was running in Central Park. During one of my faster intervals I saw a lady coming toward me who looked super fit, and as we passed each other I realized it was Molly Huddle. So cool. When I finished up with my workout, and thought I was heading toward 7th street, but wasn’t, because after a forty-five minute detour and gritty encounter with an overly excited or slightly insane trash bag wielding local, I was finally back on track toward my hotel. I usually possess a good sense of direction, which is why I never mind getting lost, I always find my way out of it, sometimes I just cover more ground than others. Finally, just a few blocks from my hotel, I was startled again by someone yelling out, “Taryn Spates!! I couldn’t believe it! Who knows me here? It was my friend and TeamSFQ Mandy Midget, another steely member of our squad running the marathon. She was having breakfast with her parents and saw me walking along the sidewalk and came running out to grab me. I simply I love these women. My friend and teammate Mandy and I inside a NYC diner. Next up was an afternoon excursion to the race EXPO being held at the Javits Center. Did I arrive there in the thirty minutes I had planned on? No, it took over an hour. Once again, I went left when I should have gone right, but I had buffered my day with getting lost time and just enjoyed the gorgeous golden leaf and blue sky tour of the city. The upside is that I was expecting the EXPO to be a complete madhouse, there were over 50,000 runners, but New York had it down. I was in and out of there in no time with my bib, a spiffy new visor, an indulgent three minute stop at the ThermaGun booth, and a quick photo op stop before I was headed back to my hotel. Don’t worry, I could’ve lead a city tour by this point I knew the streets so well, I made it back there in a flash, and even with enough time to put my legs up before meeting up with my friends, Sarah and Gerard. Yours truly with the hippest couple in New York, Sarah and Gerard. Sarah was the first person I met in college. I practically tackled her as she sped by my dorm room during orientation week our freshman year. We were in the same sorority together, (until I dropped about three months in), but we lived together our senior year, (along with four other crazy girls), and she moved out with me to LA after graduation. She cheered me on for my first marathon, my seventh, (my first Boston qualifier), and we raced together at Vineman in 2010. 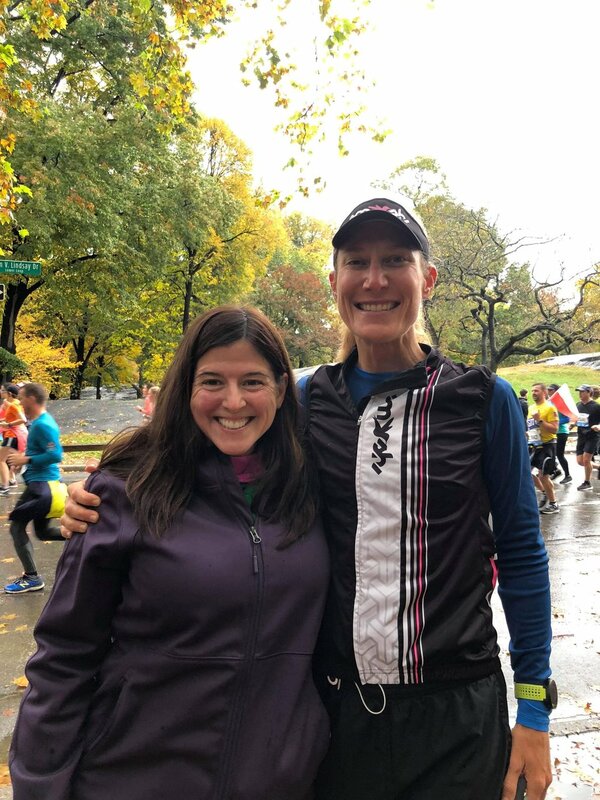 Sarah is one of my favorite people on earth, and the chance to spend time with her and her dashing, hilarious, and brilliant husband, Gerard, was a big reason why I chose to run the NYC marathon. Next up on my agenda was dinner and sleep. I had a fairly easy time finding plant-based food all weekend, but since I did not have access to a kitchen, in lieu of my usual sweet potato pre-race dinner, I ate mixed salty nuts, a couple of bananas, pretzels, hummus, an oatmeal cookie, fruit, and a red berry Naked juice. It was not ideal. I DO NOT recommend those items as a proper pre-race meal, but I wanted to play it super safe, and not eat anything unfamiliar. Plus, since I wouldn’t be running until 9:50A, but needed to be up by 4A, I had plenty of time to get in some quality calories in the morning. I know that I slept, because I had a terrible dream about a Brad Pitt chasing after me, and not in a good way. I was wide awake at 3:30A EST, I maybe slept three and half hours, whatever, I was PUMPED! This is where the lore of the New York City marathon comes in. The starting line of the race is near Fort Wadsworth on Staten island. My start time was 9:50A, but my ferry time was 5:45A, which meant I was out of my room by 5:01A, in a cab by 5:03A, and on my way to Whitehall station between 5:04 – 5:25A. Once I arrived at the Ferry depot any last drop of stress floated away. Making the ferry was the only wild card I worried about all weekend. There were cheerful volunteers scattered around telling us we could board the current 5:30A ferry or wait for the next one, I saw no reason to wait, so I boarded the ferry, sat down on an open bench across from a kind and funny runner named, Jack, from Rochester, NY. Jack was chasing down his speedy 2011 self by running the marathon this year. He raised $5,000 for a charity benefiting Down’s Syndrome to honor of his friend’s son in order to get his spot. After we swapped stories about PR’s and hopes for the day, we both stopped and recognized that being able to run a marathon at all is the real victory. I never saw Jack the rest of the day; I hope he had a wonderful race. Next, we boarded a bus that took us on a twenty minute drive or so to Fort Wadsworth, our pre-race staging area just below the Verrazzano Bridge, aka, the starting line. I stepped off the bus and walked up to the mini-city the NYRR had set up to accommodate the massive amount for runners, and was astounded at what laid out in front of me. We were separated by our colored corrals, Green, Blue, and Orange. I was in the Green Corral, and as I walked up to settle into our mini village for the next three hours until the cannon went off, I was pleasantly surprised to see an endless line-up of Port-O-Potty’s, booths brimming with bagels, water, and coffee from Dunkin Donuts. If there was any doubt that I was on the East coast, seeing Dunkin Donuts at every glance put that doubt to rest. I spent the next two hours or so eating a Picky Bar, (I ate a Lemon Poppyseed Bobo’s bar on the Ferry), half a banana, drank some water and one small cup of coffee, nodding off while sitting against various fences, (I lost each spot after bathroom breaks). Soon enough I started to peel off my layers to donate to the Goodwill bins and walked toward the corral staging area. If it was pitch black outside, my smile could have lit up the world, I was SO excited to run. The vibe in our corral was tense. No one was talking. That was fine. It was cold, but sunny, so I still kept one layer on, plus my gloves, but I wouldn’t keep them for long. I knew I would warm up pretty quick. I did get the chills and cheered out loud when the announcer introduced the women’s pro field. Those amazing athletes were right above me on the bridge. I have never felt more comfortable in my skin as a runner than I did at that moment. Hearing Shalane Flanagan and Des Linden’s names out loud, a privilege I did not have in Boston, shook me to the core. I felt honored to be running the same marathon as two of the greatest American runners of all time. I knew they would both bring it, and I would, too. As we walked up the last few couple hundred yards toward the starting line, I thought to myself, I don’t have to swim, I don’t have to ride, all I have to do is run, so give it EVERYTHING! They diverted the colored corrals the first couple of miles, the green group started on the lower level of the bridge, which meant the first mile was cold and uphill. I felt like I was running at a decent pace, but when I saw my first split appear at 8min. something, I said out loud, “No way!” And took off! Mile two was much quicker. In fact, it was the fastest mile I had ever run, coming in at 6:07min. That’s nuts! Yes, it was mostly downhill, but I think that was my pride propelling me forward more than gravity. I saw that split and that thought Garmin was playing a trick on me, but I slowed down anyway, keeping my pace within the reasonable range of 6:30 – 6:54 min. through mile fourteen. Um, yeah, that is nowhere where I was supposed to be running. That was faster than my best half marathon pace. In fact, I felt guilty as I was running through Brooklyn, because I knew my friend’s Annie and Hillary, (the OG marathoner in my life), and her family, her husband Mark, and their two kids, three year old Ruby, and seven month old Archer, would be cheering near mile seven. Consequently, I was running much faster than I predicted, and I was on the shaded side of the street, which of course they would not be subjecting the kids to, so I did not see them, and they did not see me. Honestly, I really wanted Hill to see me run. I was always impressed by her dedication to running every day in college, rain, shine, snow, or sleet, she never missed a day, and I knew seeing her smile would give me a jolt, but I must have felt it anyway, because I flew through Brooklyn and picked up my pace running towards Queens. It was right around mile nine that I realized my watch was working. Yes, my splits were lower than normal, but consistent, which meant I was really doing this. The section of the course through Long Island City, I think, was thick with boisterous crowds, but I couldn’t hear any of them. I was deep in the zone, experiencing the exact definition of Mihaly Csikszentmihalyi’s state of flow: The mental state of operation in which a person performing an activity is fully immersed in a feeling of energized focus, full involvement, and enjoyment in the process of the activity. Yep, I was definitely feeling the flow. I also knew it wouldn’t last, so it was best to bank as much time as possible while I felt so good. Mile fifteen was across another uphill bridge, but this time I stayed under 8min, clocking a conservative, yet respectable 7:42min. mi. I picked it up as I ran down the other side, and scurried through miles sixteen and seventeen hanging onto 7min. miles, and just before mile eighteen, I heard and saw a miracle, Sarah appeared cheering to my right. I wished I looked stronger when she saw me, but I ten times stronger after seeing her. Another bridge took us over to the Bronx, (sadly, J.Lo was nowhere to be found), but this is where I broke out my Master’s in Marathoning, (this was my fifty-second), and settled into a smart, 7:30 – 7:44min. mi. pace for the duration of the race. I did zero recon about the course beforehand, but I heard rumblings that the final six miles were tough, so I knew this last stretch was going to hurt. For most of the day I was thinking of going sub 3:10hrs. That was the time I wanted to hit in Boston, and was in proper running form to do, but Mother Nature snatched that dream away in April. This time around, over six months and two Ironman’s later, I had no doubt I would go under 3:10, the only question was by how much? I know, it seems strange, I should’ve been ragged and depleted by months of intense training, a very challenging Ironman, and a few weeks of mental and emotional exhaustion trying to decipher if I did well in Kona or not? But as I was lying in bed the night before, wishing for at least fifteen minutes of sleep, a cloak of confidence draped over me, and I just knew I could run however fast I wanted to during the race. I may not have been in the best running shape of my life, but my overall fitness was still the best it had ever been, and I had faith it would support a hard run. Near mile 23, when things started to get real. It did, but the last three miles were hilly and hard. Thankfully, I heard my TeamSFQ teammate, Hallie, cheering for me as I was running through mile twenty three, which was clutch, and then Sarah, Gerard, and our friends Matt and Erin came into sight, I couldn’t believe they traveled to two different spots of the course, that is a huge task, thank you! Finally, as I passed the mile twenty five marker I glanced at my watch and knew if I cranked up my speed a little, I could go under 3:10. Seeing Annie in the crowd at mile 25.5. Annie had booked it from Brooklyn to come see me finish. I couldn’t believe it. I sped up as fast as I could, and crossed the finish line in 3:09:56. Yes. “Oh, that’s too far, you want to take a train.” They replied in unison. “I’d rather not take a train, so which way should I walk? I walked through the barricade and found some lovely real estate on a curb to loosen up my shoelaces, when I was approached by a twenty-something gentleman with blonde wispy hair, and a barely there peach fuzz mustache. “Excuse me, my name is Igor, I am a reporter with the Times, (I actually forget which newspaper), can I ask you a few questions? “Yes, of course.” I hopped up from the curb as quickly as I could and answered his dozen or so questions. “Yes, thank you so much.” I replied. The street we were standing on was quiet, but it was the only street they were letting us through? This is when it really hit me how well I ran the race; I finished before a lot of people. I placed 2,091 out of 52,704 total finishers, 202 out of 22,112 women, and 35 out of 3,312 in my age group. Whoa. I hung on that fact for about nine seconds, and then started walking. I wanted to make it back to my hotel as quickly as possible, because I had an afternoon date with Hillary and Annie in Brooklyn, and I was freezing. I walked to the end of the street, and flagged down one of the those bike taxi’s, hopped in the back, and let my rider pedal me down Columbus Ave. for a mile or so. The sun felt good. The traffic was horrendous, so once we got close to Columbus Circle, I hopped off and walked the rest of the way down 7th Ave. toward my hotel. I was wearing the heavy-duty blue poncho they gave us, my medal was clanging against my chest, and I was hobbling, so it was no secret how I spent my morning. “Sure, of course.” I said proudly as I saw the girls, who appeared between eight and eleven years old, look at me like I was an Olympian. It was such a special experience. I thought to myself as I was smiling for the photo, I hope these girls remember this sweaty tall lady with super a cool medal, and they start to believe that they could run a marathon one day, too. “Thank you.” We all said together, then parted ways and I glided the last block or two to my hotel, hopped up on the greatest Runner’s High I have ever experienced. The next hour or so were a flutter of cleaning up, checking all sorts of amazing messages from friends, family, my coach, and beyond, and meeting up with my friends Annie and Hillary for our date in Prospect Park. Thankfully, Annie met me at my hotel and guided me along our subway excursion to Park Slope, Brooklyn. The combination of my wobbly legs and throbbing body, plus my fuzzy post-race brain, would not have made for a successful trip on my own. Subway ride to Brooklyn with one of my favorite Fabik sisters from Colorado, my friend Annie. The next couple hours spent with these two wonderful women, two of my favorite people on earth, and but who I rarely spend time with any more, was the ultimate reward of the weekend. I love marathons, and this one was my favorite, but I really came to New York to see my friends. Beautiful fall day in Prospect Park. A HUGE surprise and absolute bonus of the weekend was when I received a message from my TeamSFQ and TeamHPB teammate, Libby, the week prior if I was up for meeting her for breakfast on Monday morning? I had never even considered this as a possibility, because I knew she lived in New Jersey, but since I have zero geographical knowledge of the east coast, I had no idea if that was close to Manhattan? She assured me she could take an early train, and by 8:45A we were walking together in the rain. This was such a pleasant surprise, because even though I had never met Libby in person, we had gone back and forth the last few months with book recommendations, and various life check-ins, and I felt like we were on the same wavelength. However, she is a trauma surgeon, and I work in the entertainment business, so we have our differences, but we are both triathletes and have the same coach, so I knew we had much more in common than not. 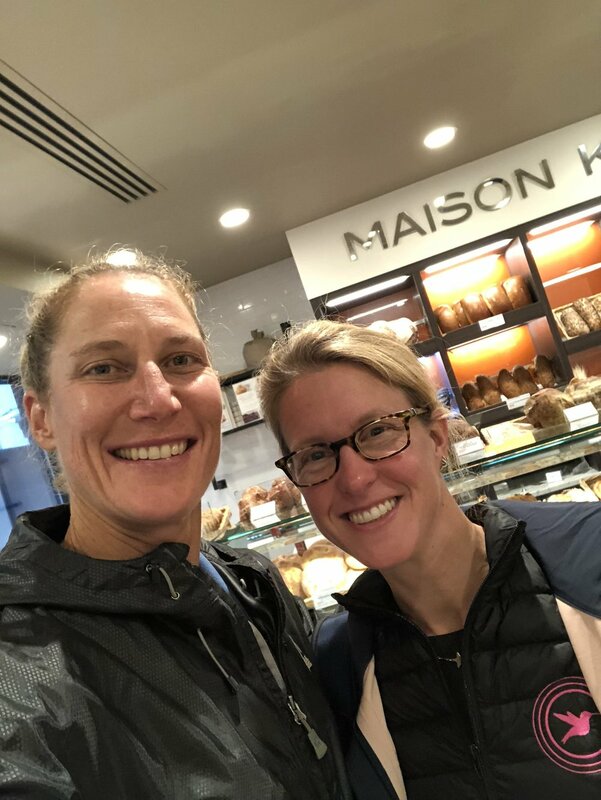 Monday morning breakfast date with my friend and teammate, Libby. It was such a fun morning. I look forward to grinding out some fun/really hard workouts with Libby at triathlon camp next April. After breakfast, I returned to my hotel, packed up my stuff, but still had one more friend date before catching my flight back to LA. Hillary took me on a fun walking tour during her lunch hour near her office by Madison Square Park. We strolled through the park, down to Union Square where we tasted delectable veggies from the Farmer’s Market, and had lunch at a cute, healthy restaurant in Greenwich Village. It was the perfect way to finish up my weekend in New York. I am so impressed and amazed by the many women I saw over the weekend; new friends, old friends, but all of them, great friends. As I sat in the back of the cab, and cramped airplane seat the rest of the day, I thought about how running marathons has connected me with so many wonderful people and places over the years. Winning a marathon in front of my brother Tim and his family in Basel Switzerland, meeting my friend Rob in Northern Ohio, and connecting with Sarah, Hillary, Annie, Libby, Sherri, and Mandy in New York. Also, I thought about how at thirty nine years old I am faster than ever, and have no plans of slowing down.